1. Knowledgeable: an endless source of information about how to do everything in the virtual community... from blogs to on-line markets... from self-promotion to staying authentic to your personal expression and more. 2. Accessible: through podcasts and videos, Marisa welcomes you lovingly and makes you feel like any question you might have is perfect. She's also sure to answer it thoroughly and thoughtfully. 3.Generous: some artists keep their techniques and tools a secret. Not Marisa, she believes in sharing everything she does and knows... each link and resource is made available. I felt like I was given the "golden ticket"! 4. Inspirational: Marisa is making a living doing what she loves and wants to share just how possible it is for others to do the same. She motivates you to find out exactly who you are and what you want... and then cheers you on through your self-discovery. I'm still digesting all that I learned, and need to go back and revisit my notes and re-listen to a couple podcasts. I am certain that this was the most worthwhile investment I've made in myself and this path I began 1 1/2 years ago. I stumbled through so much of the beginning days of maya*made. I had to figure out everything on my own... from the little technical blogging difficulties to the way to navigate through this online sea. I would have given anything for Marisa's hand to hold back then. 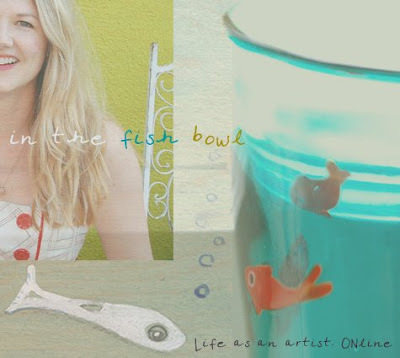 I've come along way, but my questions don't seem to end and my need for support and advice aren't going away... so having Marisa, and the amazing community of other fish in the the fishbowl, lifted me to new places of confidence, community, and understanding on my journey as an artist, designer, and blogger. She's offering another round of In The Fish Bowl in September, and I couldn't recommend it more highly. In fact, I'm jumping up and down and tooting her horn! If this sounds in any way intriguing go read about it more in Marisa's words here: In the Fish Bowl: September e-course. I'd be happy to answer any of your questions and I know Marisa would, too. I think it's safe to say that most, if not all, of the participants In the Fish Bowl (fish/fishies as we've come to call ourselves) have fallen in love with this warm and honest woman reporting/teaching from her sunny L.A. studio. The wonderful thing is... she helped us fall in love with ourselves and our own process along the way! How's that for a "gush" post?! Wonderful post and I agree completely! I also took the fishbowl course and going through a bit of withdrawal now that it has ended. But I've learned so much and feeling very motivated! Go Marisa and crossing my fingers for fishbowl level 2 at some point! I've been on the fence about taking an e-course, but I just signed up for this one. It's time to make a little investment in my business. Thanks for the "gush"
I can't wait to see how the next stage of your creative artistic journey unfolds. I know it will be amazing and I will be watching with starry eyes. Have a wonderful weekend. True gushing there Maya! All true! You are quite the sales person. Glad it was so good and helpful for you. I am sure you will generate lots of business her way, and your way too with all you have learned. Thanks for sharing. Lynn, my hope was for it to read as my total enthusiasm for this amazing experience and to spread the word... not too much like a sale's pitch. I had nothing to gain by doing this testimonial and Marisa was not involved in the least (except when I asked permission to make a collage with her photos). I've never taken an e-course, and had no idea what I had to gain from it. The changes will be subtle to readers, but huge for me personally... and possibly professionally, too. I just think there are so many artists and creatives that would benefit from it. ok, enough, said have a great weekend with lots of stitching time! 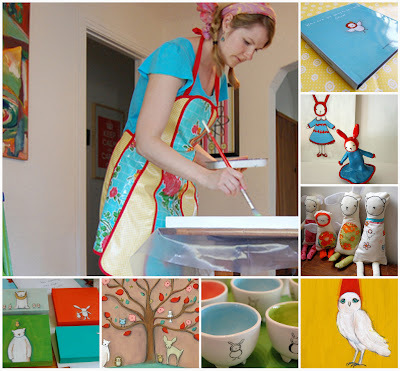 I just read a wonderful article about you and your creations in the latest GreenCraft magazine. What a treat it is to be part of a community of artists that share so openly each new innovation. Thank you. Hi Maya. Just letting know I was on the fence about the course (financial, time, etc.) but after reading your post I decided to go for it. It really is a great price when you break it down per class. I am very excited! And I am mom too so if you did it I know I can. Maya, thank you for the gift of this post! I've just been sipping and reading and listening all the while to Marisa's podcasts. I'm just brimming with a feeling of peacefulness about the "what next?" aspect of so many things in my life right now. I'm going to link to the podcasts on my blog so that this gift can be passed on to an even greater number of hearts and hands. Thank you Maya! Thank you, Marisa! Big love to both of you. Holy Cow! Intended sales pitch or not, I'm thinking it has karma all over it. I've been contemplating these very things so I did it too, I signed up as an early birthday present to myself. Wow. This was very gushy. But just so absolutely lovely - I'm ever so curious to learn more... Thanks for sharing your wonderful experience with us - I can't wait to check it out! Maya, you said this so well. I'm still digesting all that I learned about myself and my process from her class. I wanted to write some sort of recap as well. But I think you said it so well I may just end up linking to your post. Loving your blog. I signed up yesterday for the newest march course marisa is going to do. I can't wait! I was very ecxited already but now i am bubbling and jumping up and down.